Read the recommendations for the activities, best restaurants, attractions and shopping places in Bilbao, Spain. Discover the best accommodation options. Warmth, vivid nature, culture; what more could you hope for a city vacation? Bilbao offers all and more. The largest city of Basque Country is famous for its rich art scene and delicious cuisine, hidden away in the green hills of northern Spain. Mass tourism has never got a strong hold of the city, giving it a fresh view away from the tourist-populated resorts of the south. The Basque Country is renowned for its cuisine. Culinary experts around the world converge here to feast on small tapas-style delicasies, such as pintxos. One of the most common dishes is the Atlantic codfish, readily available in all restaurants around the city, and you can be sure of it being fresh of the trawlers docking at the river harbours. Bilbao offers a variety of upscale restaurants, but you can find brilliant food served at the bars favoured by the locals. A popular night out contains pintxos served with beer or cider, while enjoying the company of friends and visitors. More than anything, this city is a cultural hub, with a rich art scene. Several galleries and the Guggenheim Museum, located inside a modern architecturally marvelous building, offer a great variety of both local and international masterpieces. One can spend a whole day exploring the art galleries and museums in Bilbao. Bilbao is located at the Atlantic coast of Spain, on the northern range between the larger Cantabrian Mountains and the Pyrenees. If you arrive to Biarritz Airport, you will have many options for getting to the city center. You may take a local bus to Biarritz from which you can travel onwards to San Sebastian by train, continuing to city center by a bus. A bus service operates every half an hour from Bilbao Airport arrivals sidewalk to Gran Via 79 Viajes Ecuador, Plaza Moyua and Almeda Recalde 11, or you can always get a cab from the terminal taxi stations. The main train station, Abando Station, is located at the centre and it is the most convenient way of exploring the rest of Basque Country. By the Nervión river banks lies the symbol of the city; the Guggenheim Museum. The building is an attraction in itself as a modern architectural masterpiece which has divided local opinions ever since its opening ceremony in 1997. The museum exhibits works by Picasso, Warhol and several other international artists. The old town of Bilbao, Casco Viejo, is relatively small yet charming. The heart of old town is Plaza Nueva, containing a variety of delicasies, handicrafts and cafes. This section of Bilbao holds the seven original streets of the city, las siete calles, as well as the Cathedral of St. James (Santiago Cathedral). For visitors interested in art and culture, the Guggenheim Museum is not all the city has to offer. Museo de Bellas Artes, the most esteemed art museum of Bilbao, showcases a wide variety of works from modern paintings to Gothic sculpture. 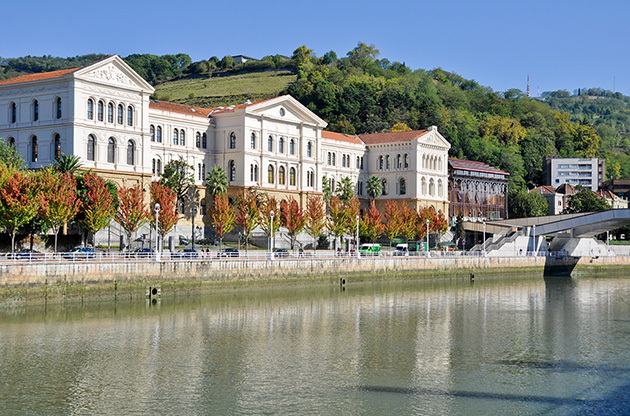 For an introduction to Basque Country history and culture, you can visit the Basque Museum, Euskal Museoa. From Gothic to Baroque, the churches of Bilbao are not to be missed. The Cathedral of St. James, Iglesia de San Antón, Basílica de Begoña and Iglesia de San Nicolás await you, showcasing 14th to 19th century architectural styles at their greatest. For high-end brands, head out to Plaza Moyúa. Here you can find international brands from Zara to H&M. Leading you away from Plaza Moyúa is Gran Vía, with its large boutiques of fashion and El Corte Ingles department store. The Basque love of gastronomy is most prominently visible in their pintxos dishes. These delicious variations of the Spanish popular tapas snacks are very the miniature works of art. Located on a street full of pintxos bars, Aritz has won many awards for their appetizers. Basque cuisine at its best within a large theater hall and stage, offering a creative yet authentic local menu. On weekend nights the place transforms into a popular nightclub with guest DJs. Taking pintxos to a new level, Restaurante Kasko markets their snacks as a journey to miniature Basque cooking culture. As the Atlantic currents can make winter nights quite chilly, the best time for enjoying Bilbao nightlife is the summer season. On weekends you can meet plenty of locals and Spanish tourists within the many snack bars and restaurants. Casco Viejo is particularly popular for hanging around before heading indoors to nightclubs. Besides Kafe Antzokia, there is a lot to choose from. Plaza Nueva is the centre of nightlife in Bilbao, holding a variety of bars of which the most iconic is the Café Bar Bilbao. For a weekend night out, head out to Pub Witch, which is famous for its coctails and dance scene, starting from midnight. Great for live music, from jazz and blues to funky groove. Rent a car and explore the towns and cities around Bilbao, such as Balmaseda, Getxo, Guernica and Portugalete. They are all just an hour or two away, each with their particular charm. For a plunge into the city’s history, take a tour on board the double-decker bus circling the city sights. Bilbao gains more reputation each year as a destination for international events. Thanks to its high bed space and stunning venues that are fully equipped with the latest technologies, Bilbao writes its name under the numerous successful global gatherings. Conferences, congresses, trade shows, fairs, symposiums and exhibitions draw worldwide attention to the city and makes Bilbao more and more preferred city as a host city for these kinds of events.